Heading to New York City on a Budget? New York City is not normally considered budget friendly. Use this list of free things to do in New York City to stretch your budget. We are always traveling somewhere. Many people ask me we can afford to travel so often. If you have read some of our other travel articles, I stretch our budget using free things to do in whatever area we go to. Many people are surprised that there are so many FUN free things to do everywhere you go. This list of free things to do is sponsored by Central Avenue Hyundai, in Hartsdale, NY. There are so many Free Things to Do in New York City that it is impossible for me to list them all. 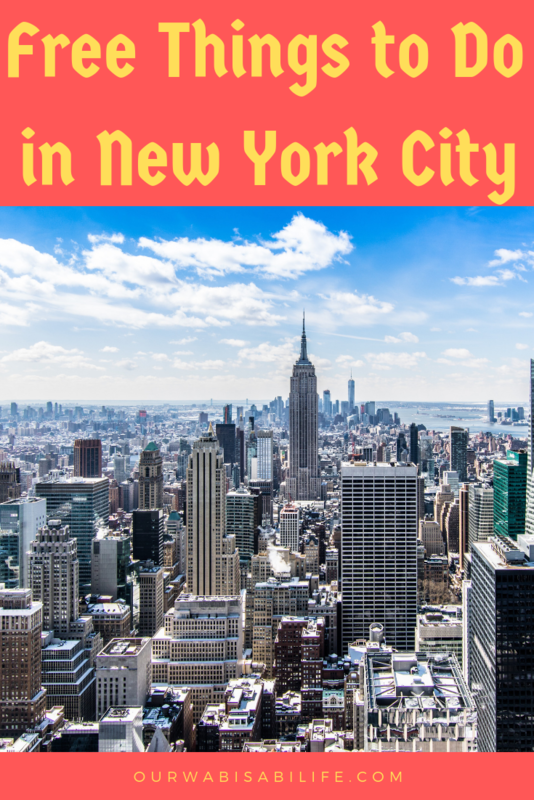 However, this is a great list to get you started on Fun Things to Do in New York City. Central Park offers many free, and paid, things to do. Central Park offers free events and concerts, a beautiful pond, walking trails as well as other things. Central Park even offers free tours that many people do not know about. The Old Stone House is dedicated to teaching history as it has affected the Old Stone House and the Brooklyn neighborhood. The Old Stone House is a reconstructed of a 1699 Vechte-Cortelyou House. The house is in Washington Park, on the border of Park Slope and Gowanus. The Williamsburg’s Brooklyn Brewery offers free tours every hour on Saturdays and Sundays. Located in Lower Manhattan, the African Burial Ground is a fascinating place to visit, but it is surrounded by controversy. The area was a construction project that started in 1991. As the construction progressed, it unearthed a burial ground of slaves with over 400 caskets. The visitor center retells African-American history in New York. Every Friday, there is a 90-minute walking tour led by two historians, which includes the “whispering gallery” and the Chrysler Building. On Fridays, from 6-9pm the gallery exhibits are free to view. However, films and lectures do involve buying a ticket. Two presidents have taken their oath for office in New York City, George Washington, and Chester A. Arthur. The Socrates Sculpture Park is located on the East River, overlooking the Upper East Side and Roosevelt Island, on a former dump site. Now the Park is a lovely place to visit filled with art installations, movies on Wednesdays in the summer, and light shows. The Park offers self-guided tours, which last about 35 minutes, for free. New York City is known for culture. One of the most concentrated areas for art galleries is in Chelsea. The galleries are free to enter and there is no pressure to buy. On Thursday evenings, many of the galleries offer wine and cheese. Check out the website in order to get the listing. National Museum of the American Indian has three locations, one in DC, the Cultural Resources Center, and the George Gustav Heye Center, in NYC. It has one of the finest collections of Native American art. The City Hall building in New York City is the oldest city hall in the country, opened in 1812, that is still used for its original purpose. During the tour, you will see the marble hall, the governor’s room too. You will also see the spot where Abraham Lincoln’s coffin was in. Tours are available and should be reserved in advance. Founded in 1838, the Green-Wood Cemetery is the resting place to 600,000 people. If the bodies were laid head to toe it would stretch 530 miles. Located at Battle Hill, the area features a seven-foot statue of Minerva, the Roman Goddess of Wisdom. While visiting, watch for the green parakeets at the entry. These birds are from the 1980 JFK incident and have stayed ever since. The Green-Wood Cemetery is one of the most visited tourist attraction besides Niagra Falls. The ferry tours that take you past the Statue of Liberty is pricey, around 18.50 for an adult. The Staten Island Ferry is free to ride and goes past the Statue of Liberty. The ferry has been carrying people across New York Harbor since 1905 and ferries 19 million people each year. The beautiful New York Library is the most famous New York library. It is located in Time Square and has a reading room that can fit 500 people. It includes exhibits, beautiful lions of marble, and features some amazing exhibits. You can see the original Declaration of Independence, a Gutenberg Bible, and 431,000 maps. Free tours are given at 11 am and 2 pm Monday-Saturdays. Grant’s Tomb is the General Ulysses S Grant National Memorial. The Civil War hero, who was the 18th president, and his wife, are entombed in the largest mausoleum in the country. The memorial is a copy of Mausolus’ tomb in Halicarnassus, one of the Seven Wonders of the World. Build in the 1030s, during the Great Depression, the Rockefeller Center has much more to offer than the Today’s Show and the famous Christmas tree. When you visit, you can see the art that is featured. Visit the skating rink, see the statue of Prometheus and Atlas holding the world. High Line is a public park that feels like a tourist attraction. It is an abandoned stretch of railroad track, that is elevated to 30 feet. It connects the Meatpacking district to the Chelsea galleries and ends at the south side of Hell’s Kitchen. It offers beautiful views of the Hudson River. You can also see the stars on Tuesday night. Starting at dusk, the Amateur Astronomers Association bring telescopes between 15th and 16th streets. If you enjoy theater but don’t have tickets to Shakespeare in the Park (you get tickets from a digital lottery) then you can see Shakespeare at Sunset. Hosted by the New York Classical Theatre, it can be seen at unique venues around the city. Anyone who is interested in fashion will enjoy the Fashion Institute of Technology, where it is always Fashion Week. There is a rotating exhibit featuring students. There are over 50,000 garments dating back from the 18th century. The Earth Room is one of those just have to see, but you aren’t even sure why. It is a 1977 art installation. It is a single room with 280,000 pounds of dirt with the scent of the wet forest. There are complimentary lockers to hold your things when you go to Pier 26 in Hudson River Park. They provide life jackets and give a brief lesson at the dock. New York City offers many free things to do. In addition, you can save your budget for all of the amazing things to do in New York City, that isn’t free.